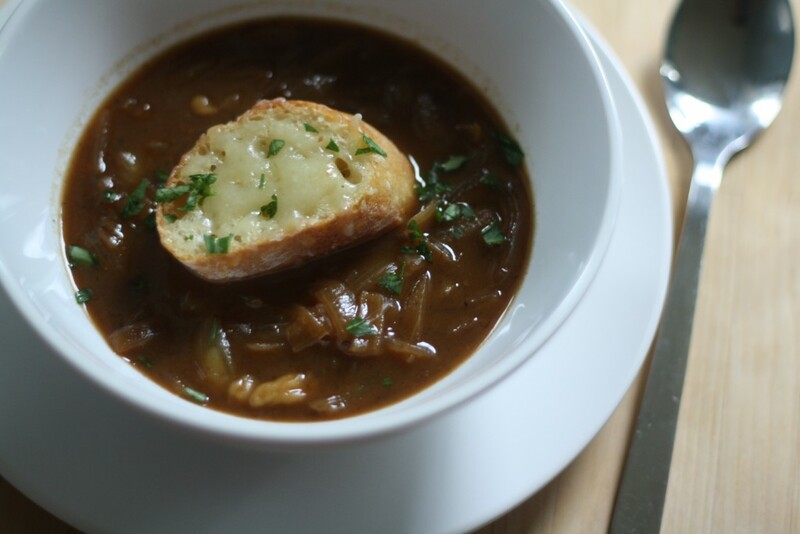 If my memory serves me correct, my French grandmother never made French onion soup from scratch. She did however make three things better than anyone else I knew. Granted I didn’t know too many people when I was seven, but she was famous for her pie crust, her gravy, and her boxed macaroni and cheese. Her boxed macaroni and cheese was the best I’d ever tasted. She used the FULL amount of butter! And CREAM! Both really made a difference to my young taste buds to which only skim milk was the norm. She also let me watch anything I wanted on cable TV, unlike the glorified toaster oven of a television that we had at home that only got channels with the correct amount of tinfoil. But I never got to watch it anyway because I was too busy tending to the worm bin and making the family supply of homemade tofu. Now that I have a small amount of free time in the afternoon, I feel it is only right to tackle the haphazard yet tidy post-it list system I keep of things to make. 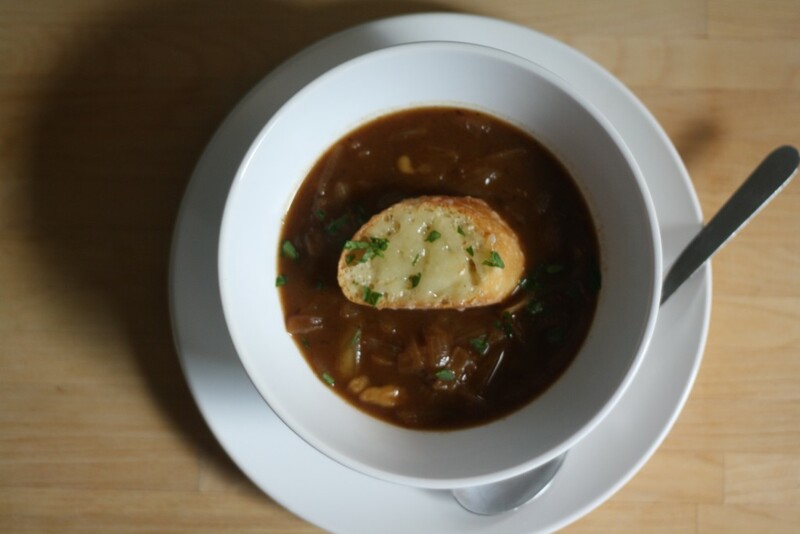 French onion soup has been floating around there for a good long while now. Since I am also considering changing the name of this site to Budget Me Up Brooklyn and onions are on the cheap – it was time for soup. I did not want to mess around so I went straight to The Master. 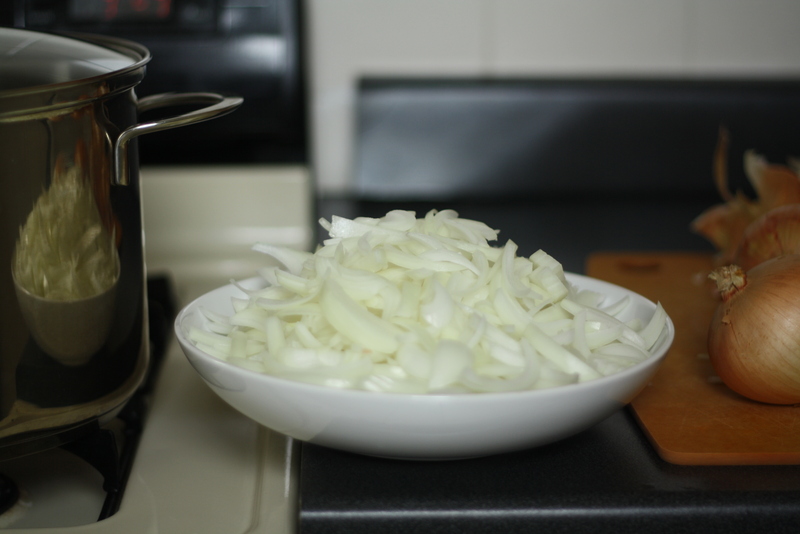 Why have I waited this long to make French onion soup? Dudes, it is so easy. The thing you need the most of is time (check! got that!) to cook the onions down. Caramelizing the onions is what really rockets them into tasteworld but really it takes only a fraction of the 2 1/2 hours you need for the soup to make magic. Do I sense a good fall Sunday cooking project? I had to do a little improvising on the topping – you know the toast and broiled cheese situation that makes everyone actually keep eating French onion soup. I was pretty sure my chipped IKEA bowls would have shattered into a million pieces had I baked them in my oven for 25 minutes, and the only oven-safe containers I have are four ramekins the size of thimbles. Fail x2. So I went the one big cheesy crouton route, and no goodness was missed. Cook the onions with the butter and oil, covered, in a large saucepan over medium low heat for 15 minutes. Uncover, turn up the heat to medium high and add the salt and sugar. 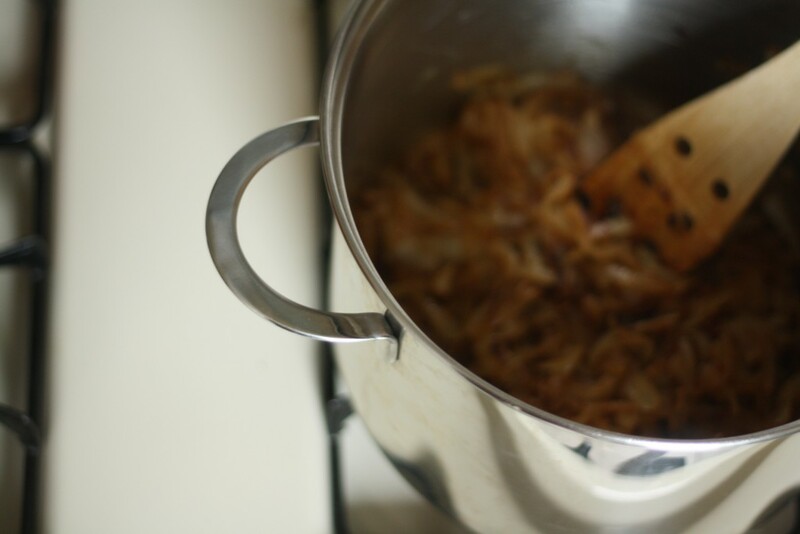 Cook for 30-40 minutes until the onions have caramelized and turned a deep, golden brown. Sprinkle in the flour and stir until it is evenly combined. Slowly pour in the broth and add the vermouth. 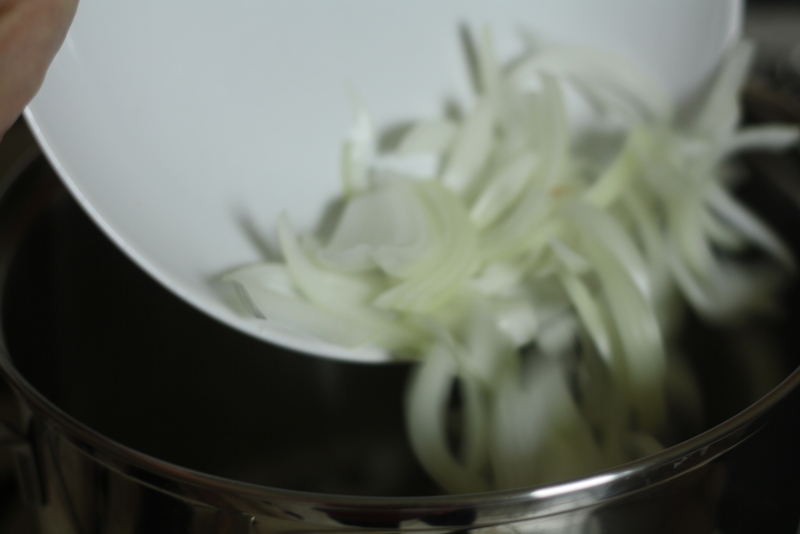 It will deglaze the pan a bit, so be sure to scrape up all the bits of onion. Simmer, partially covered and stirring occasionally, for another 30-4o minutes. Season to taste. When you have about 15 minutest to go on your soup, heat your oven to 375 and toast the bread on a foil-lined sheet for about 10 minutes. 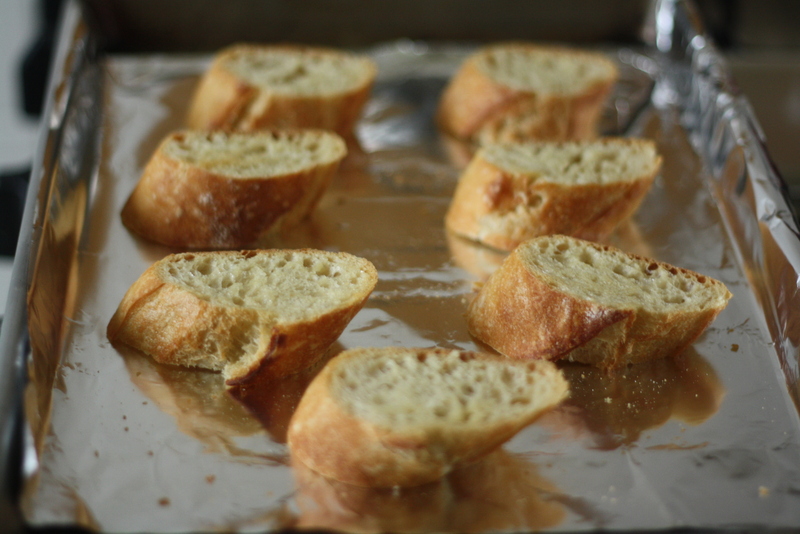 Remove from the oven and rub the toasts with the garlic. Sprinkle with cheese and bake for another 5-10 minutes, or until the cheese is bubbling. Serve immediately. Hi Lillie, I found your site through BlogHer and I’m so glad I did. 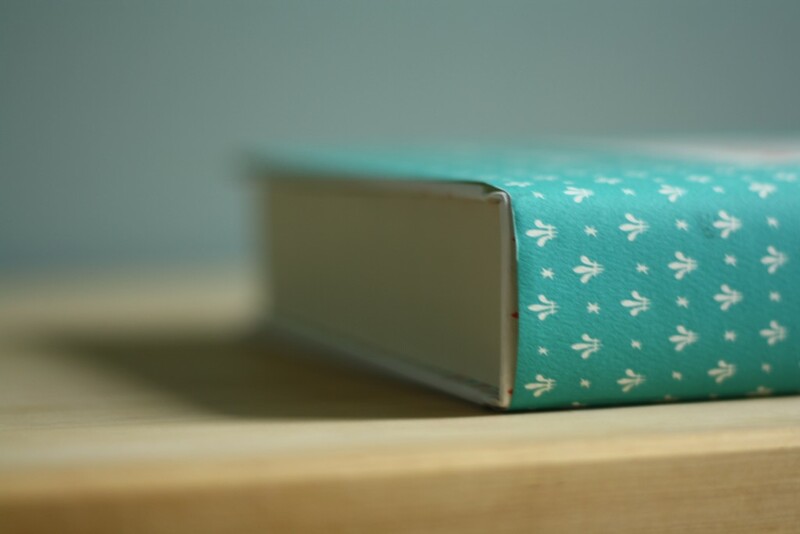 I’ve only had time to browse a few recipes, but I love what I see Are you on Facebook or Twitter? I’m not a lover of onions, but I do love the story behind this recipe and think you’ve done a valiant effort at making a beautiful soup. I have those chipped, last-legged IKEA bowls (don’t we all). One big cheesefest of a crouton is totally enough to satisfy. Hi Yasmeen – I’m so happy you found me! I love your site – your photos are an inspiration. Social media coming soon so stay tuned! I love the story and the soup!